In the late 1970s Steven Spielberg confessed to Roger Moore that he would like to direct a future James Bond movie, but due to a contractual clause that no director in the Bond franchise may receive a cut of the profits (which was a requirement for Spielberg) it’s a shame we’ll never have the chance to see that come to fruition. Instead, Spielberg met up with George Lucas in late 1977, after both had achieved massive success in the mainstream, and decided that the two would have to collaborate on a serial-like adventure at some point in the following years. 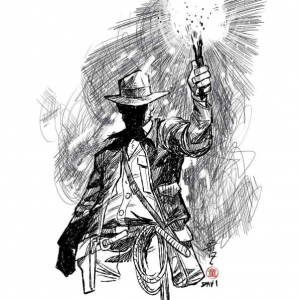 That partnership would manifest itself in Raiders of the Lost Ark in 1981, with the James Bond character mutated into a rough but tough professor and archaeologist, Indiana Jones. The dusty world of the late 1930’s is the playground for stark contrasts between good and evil in the early years of the Indiana Jones franchise, and despite the impressive box office returns of all four films in the series, Raiders of the Lost Ark remains as the critical and popular favourite.